This review is the opinion of guest contributor Laura Weaver. Laura and her husband Mike live full-time in their travel trailer and have been traveling since December 2017. Thousand Trails. It's a campground membership option that can provoke a lot of emotion. In my research I didn't seem to find many people who had a middle ground feeling about them-either there was a deep love and devotion for them or a seething hatred. It's a membership that can be a little confusing because there are so many options and statuses (Zone Pass, Alliance, VIP, Platinum, Platinum Plus, Elite to name a few) with a variety of upfront investments from about $500 - $15,000. So for my purposes, I will review the Thousand Trails Zone Pass as that is what we currently use. We have had a Thousand Trails Zone Pass membership for about 2 months, and I am by far not an expert. However, I've become very familiar with the system and we've spent 34 nights in the parks. We invested $651 for the Southwest region of Thousand Trails parks. This also includes their Encore Parks for that region, which gives us over 20 parks that we can stay at for free and with no additional nightly charge. So the more we choose to stay at one of these parks, the lower our average nightly rate is from our initial investment. For instance, when dividing our $651 investment among the 34 nights we've stayed in the parks so far, our nightly average for those nights comes to about $19 a night. Each time we stay in a park it continues to decrease, which equates to HUGE savings for us. We have a two week stay in San Francisco coming up at a qualified Thousand Trailspark, and after this our investment will have decreased to roughly $13 a night for our previous stays! In January, without Thousand Trails, our average nightly stay came out to $37, so this zone pass has contributed to large savings for our lifestyle. So what's the catch? With our membership we can stay up to 14 nights in the system and then have to leave for 7. So this means we can't solely stay at Thousand Trails parks all month. We still incur new costs in campgrounds outside of the Thousand Trails park membership, but we honestly don't mind so far because it gives us the option to explore places that aren't in the Thousand Trails system. And the savings during our stays at TT parks allows us to splurge on more luxurious parks from time to time. Do you need full hook ups? Thousand Trails parks have full hook ups. Are you content with nearby neighbors? Thousand Trails campground spots are generally in close proximity to others. Do you like amenities and activities at a campground? Pools, hot tubs, clubhouses, mini golf-just a few of the amenities some TT parks offer. What region of the United States are you interested in seeing? More TT parks are located on the coasts and boarders of the U.S. with few in the interior states. Take a look at the map and make sure where you are going has enough parks for you. How long do you prefer to stay at one spot? With a Zone Pass you will have to relocate every 14 days. How long will you be camping? If camping longer than a year, a Zone Pass may not be the right fit, and you may want to look for the larger investment passes. Those who prefer campground camping with full hook-ups and amenities, and who don't mind staying a little bit outside of the city, may enjoy what Thousand Trailshas to offer. There's also the added benefit of paying upfront and knowing you have options where you don't have to spend money on a nightly rate. We have found each park to be very different with little consistency in quality. So far the campgrounds have felt very safe, but there have been a few times we've been a little closer to our neighbor than we would have preferred. Some have the most diverse weekly events and activities-ranging from shuttled outings in the city to basket weaving and workout classes or Bible studies and afternoon tea. Members can teach classes, and I've even taught a few Yoga classes at the campgrounds. Members could even earn a few dollars on the road if you have a skill to share and people who are willing to show up and pay to learn or participate. Thousand Trails is probably not a good fit if you prefer the wide open spaces of the great outdoors, being miles away from civilization, and think campground amenities are for yuppies. If you're more of the mindset that amenities are for hotels, and there is no place for them in the campground, then TT is definitely not for you. And if you think, hook-ups? I have tanks for a reason! Then Thousand Trails probably isn't for you. And if you are desiring to stay in a region that is not heavily populated with TT parks, you will want to look at alternate campground memberships. If you're curious about buying a Thousand Trails membership you could always visit a park prior to purchasing; however, keep in mind they are all very different. Set realistic expectations. It is, after all, a campground, not a luxury resort. If you're interested in learning more I would recommend calling the sales reps I spoke with, Brandy and Jim Reneau (contact information below), and NOT calling the 1-800 number online or signing up via the website. Brandy and Jim have special discounts that online may not show. They are not pushy about signing up, will not harass you, and personally camp in the Thousand Trails campgrounds, so they have experience and know the system. They are also so nice and fun to work with. If you call them, tell them Laura Weaver or Dwell And Wander recommended them so that they will be familiar with the membership we have and can help you from there. What about you? If you RV or camp have you used Thousand Trails? Another membership option? What has been your experience so far with memberships? We'd love to hear from you in the comments. As full-time RVers, our preferred camping style is primarily boondocking. While planning for full time travel, we anticipated that we would want to spend most of our time boondocking or dry camping. Knowing this, we made a few modifications to our rig which would make boondocking more comfortable and cost effective for us, namely, installing solar panels, a powerful inverter and upgraded batteries. These modifications provided us with more than enough power for our daily needs while freeing us from relying on our noisy, gas-consuming generator. Prior to setting out full-time, we craved the wide-open spaces and feelings of silence and solitude to be found in wild spaces, rather than in campgrounds. This lead us out west, where the majority of the boondocking in the US is to be found. So far, our favorite boondocking states have been Oregon, Washington, Arizona, and Utah. Over the past year, we have had the opportunity to call some of the most incredible locations and landscapes “home” for a short period. With this post, we’ll share some tips for finding great places to boondock, as well as some things that we’ve learned over the past year. How do you find boondocking sites? We get this question a lot. We utilize several resources to find our boondocking sites, chiefly Campendium, freecampsites.net, and the AllStays app. While each of these resources can provide information on countless boondocking sites around the country (and beyond), not all boondocking sites are created equal. When selecting sites to stay at, we use several criteria to evaluate whether a site will both work for us, and if it is somewhere that we want to stay. 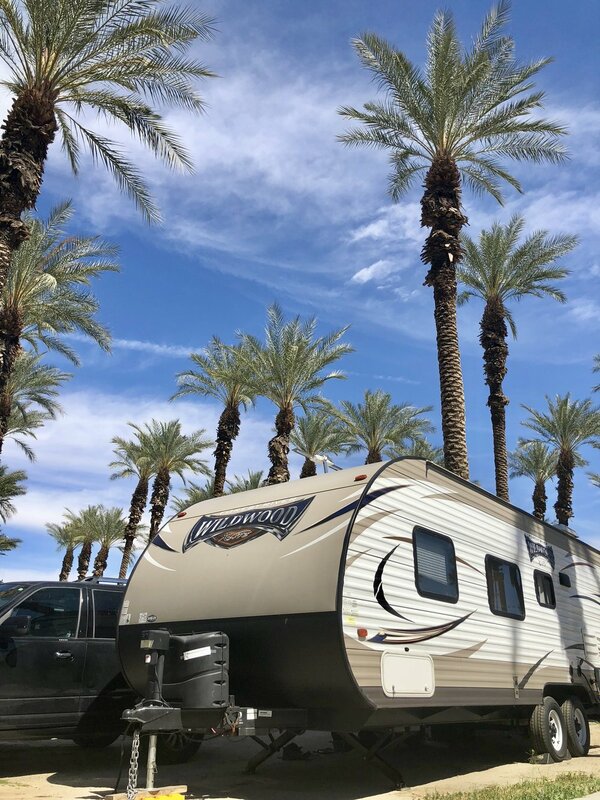 Location is the primary factor we use to pick where we will stay, and I think this is true for all full-time RVers, regardless of their camping style. When selecting campsites, we naturally look in places that we are interested in visiting. We typically make a map of all the places we want to visit and then try to find a campsite that is nearby those places. For instance, we recently decided to see the five national parks of Utah during the month of March, so we began to research sites along the route to see these five parks. That gives us a starting point for where to begin our search for the perfect site. Cell service is the most important factor which determines where we will boondock. We need connection to work, so it is not possible for us to stay anywhere without halfway decent reception. Unfortunately, the need for connection does eliminate a lot of great boondocking spots for us, but without our remote work, we would not be able to live this lifestyle at all. Campendium typically has cell service information provided by other users, but occasionally we locate a site that seems great but has no connection info provided. If this is the case, or even if we just want to double check the connection info for a certain site, we use an app called “Coverage?” This app allows the user to plug in the coordinates for a certain location and see the exact level of connection. It has been a game-changer for us. Another important factor to consider is accessibility. This refers to the conditions of the roads that lead to boondocking sites. Most boondocking sites are accessed via a dirt road, and, while some of these are well-maintained, others can be rather sketchy. We drive a large class A motorhome which has surprisingly high clearance, but roads that are excessively rocky or graded are not possible for us. Campendium reviews usually mention road conditions, so we are able to read about the road situation before entering a new site. In addition, we typically detach our tow vehicle from our RV at the beginning of the road and use that to scout out prospective sites. In all of our travels, we have only encountered a handful of roads impassable for us, but scouting helps us to know exactly what to expect before getting to our new site. It also gives us an opportunity to double check the cell coverage before arriving with the rig and needing to turn around. The last thing we consider when choosing a site is the view provided. This is the main reason we boondock in the first place. Waking up in an amazing place and looking out our windows at mountains, desert, ocean, or forest is, for us, more preferable than waking up and looking outside at another RV. While this is not the most important factor in choosing a location, it is definitely something that we consider. For example, if we are considering two different boondocking spots in the same area, we will surely opt for the one with the better view. For us, boondocking is an incredibly enjoyable and relaxing way to spend our time on the road. Being immersed in the landscapes and locations in which we find ourselves can almost be said to have a “nature therapy” affect. We have had some of the best times parked in the most gorgeous places in almost complete solitude. We’d love to hear your thoughts or experiences on boondocking! Feel free to share or reach out to us with any additional questions. View Samantha's contact information on our contributors' tab.